Though Turmeric has been used for thousands of years to treat a variety of illnesses in humans, its benefits for canines and dogs is just now being discovered. 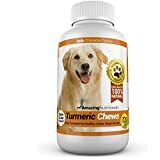 When reading the detailed reviews of our best choices for dog turmeric tablets & chews note any additional ingredients contained in the product. 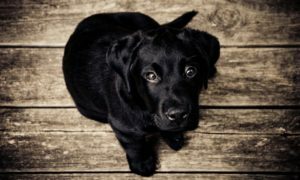 Several of the listed products have vitamins, minerals and ingredients that your pet may already be getting through a daily dog vitamin. 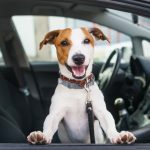 The Amazing Nutritionals Turmeric for Dogs Curcumin Pet Antioxidant bottle contains 120 chewable bite-sized bacon and beef liver flavored tablets. The product is made for puppies, seniors, little or large breed dogs. Each tablet contains 150 mg of Turmeric Curcumin. 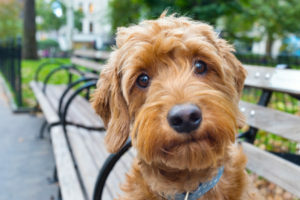 According to the manufacturer, the supplements do not contain ingredients that may cause an allergic reaction in your dog, such as wheat, corn, maltodextrin, soy or egg. The product is made in the USA and offers and instant money-back guarantee. We give the Amazing Nutritionals supplement Turmeric for Dogs Curcumin Pet Antioxidant our highest FIVE STAR rating! This Buddy & Lola Turmeric Curcumin for Dogs contains 120 venison flavored tablets. Each tablet contains 200 mg of Turmeric in addition to stearic acid, magnesium stearate, croscarmellose sodium and venison flavor. The product does NOT contain wheat, corn, soy, or glutens. They are made in the USA. Though we like the level of Turmeric in each tablet, there are reports that dogs may not care for the added flavor of venison, so we rate Buddy & Lola Turmeric Curcumin for Dogs THREE STARS. The Zesty Paws Turmeric Curcumin Treats for Dogs jug contains 90 duck flavored chews. In addition to each tablet or chew containing 400 mg of organic Turmeric, it also includes 20mg of coconut oil & 5mg of “BioPerine”. BioPerine is “a special ingredient is sourced from Organic Black Pepper to help pets absorb nutrients better to get the most nourishment possible… while keeping the GI tract healthy.” We agree with the many dog owners that this is a great product and give Zesty Paws Turmeric Curcumin Treats for Dogs our highest rating of FIVE STARS. 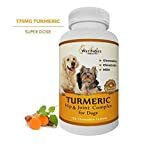 This WetNozeHealth Turmeric Complex for Dogs bottle contains 120 liver flavored dog tablets. In addition to containing 175 mg of Turmeric Extract (Curcuma longa root), the tablet also contains 150mg Glucosamine HCI (shellfish source), 125mg of Methylsulfonylmethane (MSM) and 125mg of Chondroitin Sulfate (bovine source). The tablets are made in the USA in an FDA registered factory. The WetNozeHealth Turmeric Complex for Dogs product receives our rating of FOUR STARS. Each Vita Pet Life Turmeric for Dogs hip and joint dog bottle contains 60 bacon and liver doggie chewable tablets. Each tablet contains 150 mg of Turmeric root extract and do not contain wheat, corn, maltodextrin, animal digest, grains, soy, egg, potato, shrimp, crab, shark, gluten, or avocado. The manufacturer states they are made in the USA in FDA-registered facilities that are NSF and GMP-certified. We give Vita Pet Life Turmeric for Dogs a THREE STAR rating. 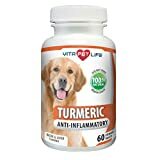 Turmeric for Dogs, Curcumin and BioPerine Anti Inflammatory Supplement, Antioxidant, Promotes Pet Mobility and Pain Relief, Prevents Joint Pain and Inflammation, 60 Natural Chew-able Tablets. Each bottle of Golden Goodness Organic Turmeric Curcumin for Dogs contains 8 ounces of 97% pure organic Turmeric. A teaspoon contains 400 mg of Turmeric Curcumin. However, since this is a liquid product meant to be added or placed in your dog’s food, the dosages (and therefore the amount of Turmeric) will vary depending on your dogs weight and size. 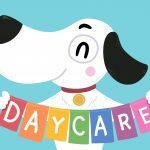 The product is made in the USA with certified organic and non-GMO ingredients. 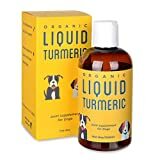 If you are searching for a “natural” or organic Turmeric product that has no other ingredients, then Golden Goodness Organic Turmeric Curcumin for Dogs is the product for you. We give Golden Goodness Organic Turmeric Curcumin for Dogs a FOUR STAR rating. As all dogs age, just like humans, they may show signs of joint aches and pains. Some dogs may even get a form of arthritis. 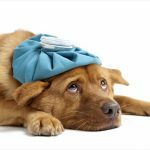 Though Turmeric, as well as other joint and hip supplements may aid in treating these symptoms, its always a good idea to visit your local vet. 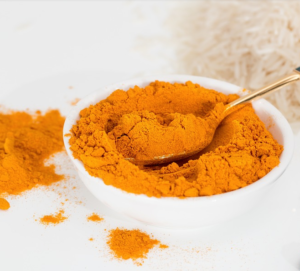 Why Give Your Dog Turmeric Supplements? Of course most dog owners purchase Turmeric for the benefits associated with aches and pains of muscles and bones. However, another exciting possible effect of giving our dogs turmeric is in the fight against cancer and heart disease. In many cases, inflammation can lead to various forms of cancer and cardiovascular disease. Not only is turmeric an anti inflammatory supplement, its also an antioxidant. A recent study So we know that chronic inflammation can lead to cancer and turmeric is a powerful antioxidant. A recent Cancer Research Study in the United Kingdom, stated that turmeric and curcumin had the ability to stop precancerous growths from becoming full cancers. 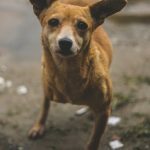 Are There Side Effects of Giving Your Dog Turmeric? 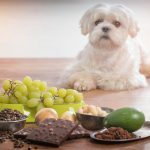 If your dog should have any side effects (or any not listed) after taking turmeric, consult with your vet as soon as possible. Additionally, when giving your pet any medication, be sure and do not overdose. Yes, a little may do a lot, but a lot more doesn’t mean it will do more! Always give the recommended dosages of any medication or natural supplement.